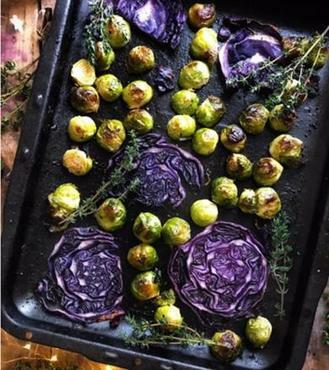 How's this for a super side dish: oven-roasted red cabbage steaks and Brussels sprouts with fresh thyme. Simply preheat your oven to 200 C / 400 F / Gas 6. In a small dish, mix oil, salt, pepper, garlic and thyme and set aside. Trim the ends off your Brussel sprouts and remove any loose and yellow leaves. Cut in half and set aside. Remove any damaged leaves from your purple cabbage, and slice into 4 steaks about 1/2 inch thick. Place cabbage steaks into a roasting pan, and surround them with your halved Brussel sprouts. Evenly drizzle oil mixture on top and give the dish a slight shake. Roast in the oven for 30 to 45 minutes, shaking pan every after about 15-20 minutes for even browning. Keep checking until sprouts are browned and cabbage is soft.